Your chance for an AO MUG!! Above is the link to the AO Conference we're having in May- our 3rd conference in ten years, and the last conference we plan to have for at least three more years, maybe more. We're hip-deep in the planning bounce house excitedly and energetically working out details right now, and as exhausting as it all is, we are getting excited, too. We have so many ideas for what we want to share with you all, and so little time.We are trying to offer a good mix of philosophy as well as practical hand-holding, sharing the why as well as the what, and speaking from our hearts about why we do what we do, and how you can implement CM's principles in your homeschool (or private school- we know we have teachers in private schools coming). One of the perks of being able to come to a conference, or just have a friend at a conference, is that up until now, this has been the only way to get one of our special AO coffee mugs or totebags. These are so pretty- many people have wished they'd ordered two, or have asked us to consider shipping them out so people who can't come to the conference can also have them. They really are lovely, and while we wish everybody who wants one could own one, we really can't redirect our time and energy from curriculum development and conference planning to shipping out coffee mugs. 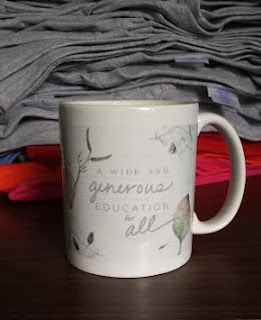 However, we have come up with an opportunity for one special reader to win a free mug and totebag and we promise to ship them out to you at our expense (but not until after the conference). To present your name for consideration for our give-away, please share the above link to our conference page on social media- FB, Twitter, Instagram, your blog, a homeschooling group you're in, Tumbler- whatever and wherever is out there that you are comfortable sharing our conference link. Then come back here and tell us about it in the comments, leaving a link to your share in the comments. EACH time you share is one entry in a drawing for a free mug/totebag combo, shipping included. So if you share the conference link on Twitter, FB, and Instagram, you'd leave 3 comments, saying basically, "I shared the conference on Twitter! (link here)." Leave another comment for a fB share, and so forth. The winner will be selected on Friday, or when we reach 100 shares, whichever comes first. Should we reach 100 shares really quickly (like, by the end of today), we'll probably give away TWO mugs and TWO totes! On Friday or when this post has 100 comments, I will select the lucky recipient of this week's giveaway by the randomly scientific process of printing out the comments, cutting them apart, tossing them in a bowl and having one of my deliciously adorable small grandchildren pull out one of the slips. Each social media platform mention is a separate chance to be picked for the giveaway- so copy and paste the link where you shared in the comments below, one per social media share. Cross your fingers and hope we draw your name, and keep an eye on this space for the next pre-conference giveaway!! P.S. Yes, OF COURSE you can enter even if you can't come to the conference.